Running Injury Prevention For Hamstrings & Glutes! At The Run Experience, we can all agree on one thing…running injury prevention is NOT an option! Take a look at our best running injury prevention tools for those tight hamstrings and “weaker than we’d like them to be” glutes! As a runner, why is it so damn important to take care of yourself REGULARLY? Believe it or not, those running injuries rarely come out of nowhere. Much like a car, repeated use combined with lack of maintenance leads to big problems. If you’ve ever had to recover from an injury, you should agree that a few minutes a day giving some love to your muscles and joints pales in comparison to multiples weeks or months spent immobile, on your couch. YOU are in control of what happens to YOUR body. Let’s look at what you can do before, during & after your workouts. Today we’re focusing on the hamstrings and glutes, but realize that this kind of work can and should be done on other areas of your body as well. Running injury prevention starts with regular maintenance of the flexibility and length of the muscles being used. 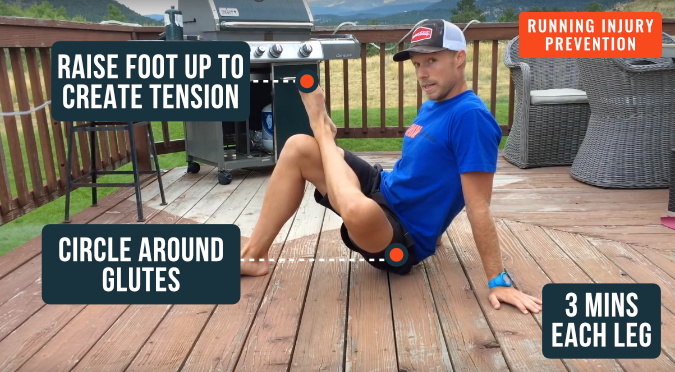 Your hamstrings and glutes naturally get tight and short as you run, but it’s your job to get them back to their full range of motion/length each day. 1) Find a standard lunge position: Hands directly under shoulders, one foot set on the outside of your hand, toe facing straight ahead, knee directly over ankle. 2) Relax and drop the hip of the extended leg as close to the ground as possible. 3) From here, you’re going bend and straighten the front (bent) leg. 4) Back leg will stay extended and relaxed. 5) Use your hands and front heel to push into extension through the front hamstring, leaving head and neck relaxed to face the leg. 6) Complete 20 “bend & straightens” per side. A dynamic movement helps to lengthen and relax the hamstrings, without creating that uncomfortable tension or pull, often felt in a static stretch. While stretching is important, it’s not the only piece of the puzzle. The hamstrings and glutes are HUGE muscle areas, and together create most of your effort as you run. In both areas, inflammation and pain can arise when the smaller muscle fibers and groups get tight and “stuck” together, making the individual fascia far less productive in producing strength. In other words, if the smallest links in the chain aren’t being taken care of and therefore operating efficiently, our body will find ways to compensate, using other weaker areas to perform, often leading to overuse, pull and injury…in this case, usually in the low back. 1) Grab a lacrosse ball, or something similar. 2) Find something to sit on (preferably something without a back) that will allow your feet and knees to hit the ground at a 90 degree bend. 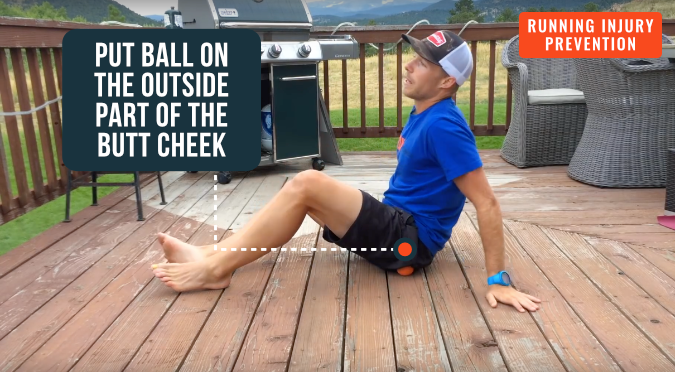 3) Put the lacrosse ball under the highest part of one hamstring, just “below” the glutes. 4) Relax your weight onto the ball, leaving other foot planted firmly on the ground. 5) From here you’re simply going to bend and straight the leg with the ball under it. 6) Note that the further into extension you get, the more intense (and painful) the stretch. 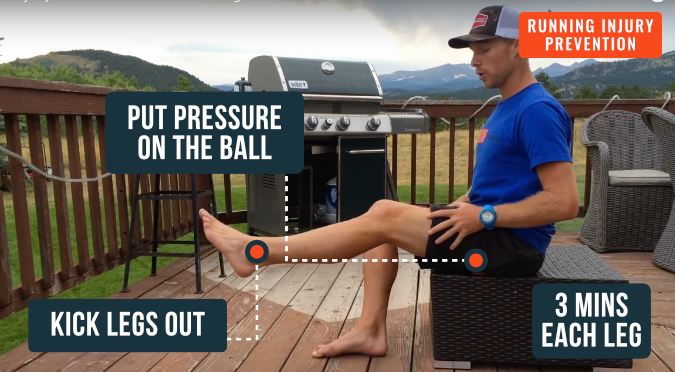 7) After a few reps, move the ball to a new spot on the hamstring. 8) Repeat in 5-6 areas, getting both lateral aspects of the hamstring, closer to the knee, etc. 9) Spend 3 minutes per leg! 1) Again, you’ll need that lacrosse ball. 2) This time, you’ll be seated on the ground. 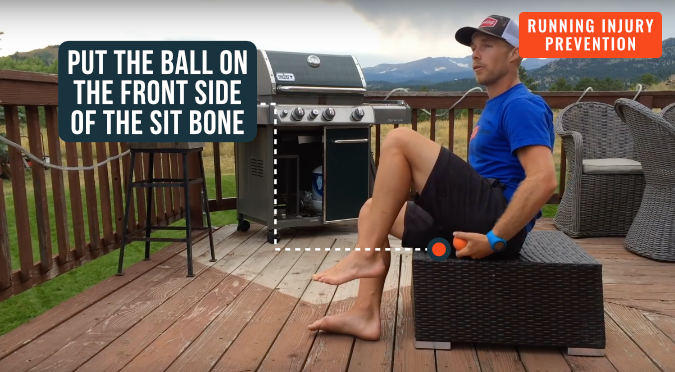 3) Put the ball under one side of your glutes, just behind your “sit bones”, where it’s a little meatier. 4) Support your body weight with both feet planted on the ground, using your arms to control pressure on the ball. 5) Start by making small circles in both directions, rolling over the ball. 6) To increase the intensity, cross the leg (the one the ball is under) over top your other leg, creating a “figure 4” position. 7) Again, play with placement and circle direction of the ball. 8) Spend 3 minutes on each side! You’ve got 1,440 minutes in your day. If you can spend just 10 of those taking care of these important muscle groups, you’ll be able to hang onto the better running form for longer periods of time and of course…you’ll keep yourself away from injury, and your couch! Like we said before, even if you have a proper running training plan to follow, your training is essentially worthless without regular running injury prevention! If your hamstrings and glutes are going to work for you, you’ve got to work for them too!